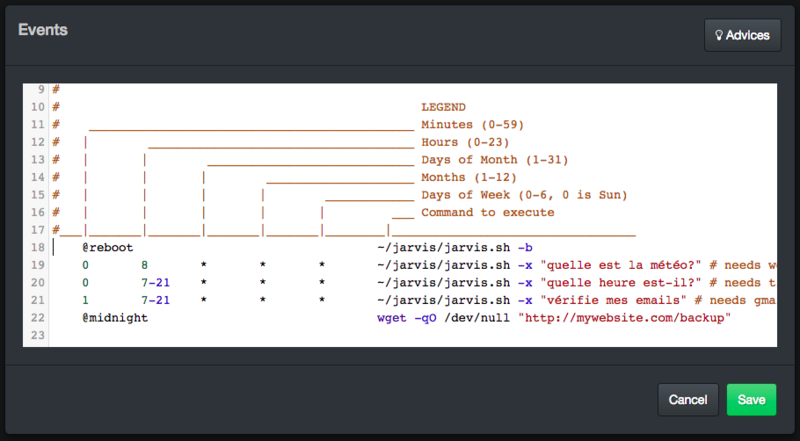 This plugin embeds a lightweight web server to control Jarvis from a user interface. The HTTP Server is based on Python, so no dependency to install. There is no configuration needed, just install the plugin and start Jarvis normally. 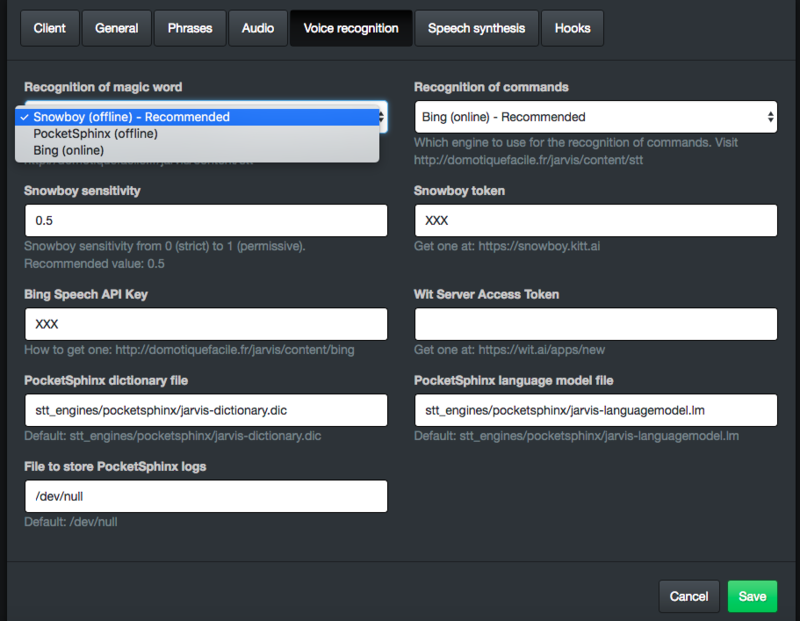 Speech recognition button only works on Chrome for Desktop and Android. This plugins needs Jarvis-API plugin to be installed. Pratique, simple, sympa. Une interface façon J.A.R.V.I.S serait TOP. 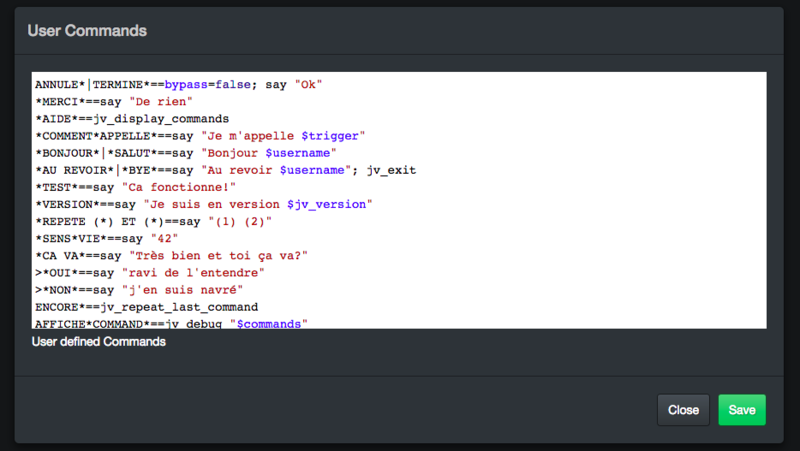 salut les gars ..je suis debutant dans ce domaine et j'arrive pas a comprendre cette phrase ( *ALLUME*LAMPE*==say "Ok" && jv_curl "http://192.168.1.1/home.php?action=turnon&device=lampe")..comment je peut controler les gpio du rasp pour donner l'ordre a allumer ou a eteindre la lampe ? Parfais. 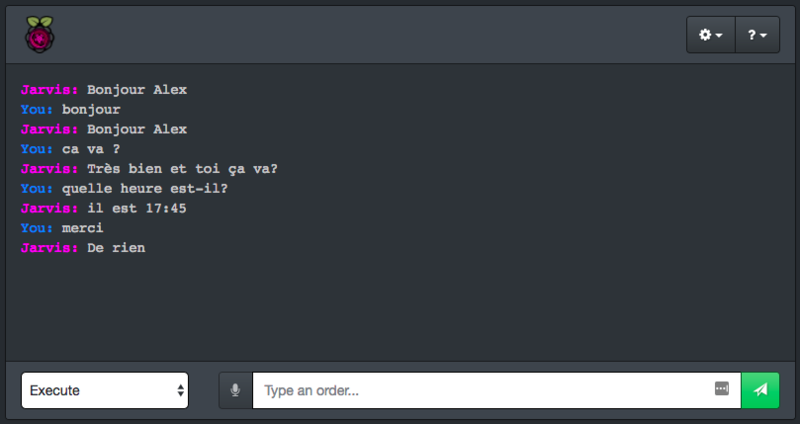 Seulement 2 questions : comment activer le micro sur le site, j'ai toujours un message d'erreur peut-on mettre ce site en ligne pour demander qqc a Jarvis avant de rentrer ou comme simple assistant vocal ou est-ce risqué, si oui comment faire (je suis un noob) Meme si vous ne pouvez pas m'aider, merci pour ce super plugin. Bonjour! It is amazing you all made this! Je ne sais pas (francais). But i know English. The amount of work you put into openjarvis is amazing. I love the UI. I was trying to use Jasper but it was outdated. This project is updated, and has UI. Fantastique! Thank you for all your hard work in France. This is a cool startup project Alex. Merci. I'm from Florida, USA. Thanks so much. I have google home but I always wanted to try to develop something myself so it could do more things than home could. This is a nice platform to extend from. I was looking for Offline. Because i don't like big brother. And i don't like latency and lag and waiting lol. Snowboy is great. Maybe one day i will contribute but for now i enjoy. tres bien. au revoir!